Prior to the discovery of antimicrobial medications, treatment of mycobacterial disease was primarily supportive. The development of many thoracic surgical techniques was in large part due to attempts to treat tuberculosis and its complications. 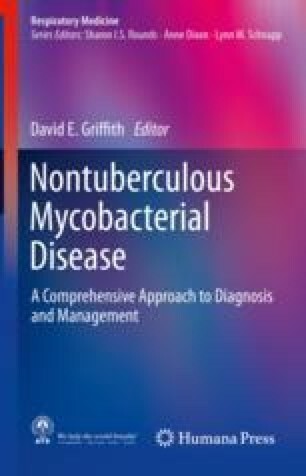 While antibiotic therapy is the mainstay treatment for nontuberculous mycobacterial (NTM) infections today, cure rates with medication alone remain low. In experienced centers, a multidisciplinary approach employing antibiotic therapy and surgical resection has been shown to be effective in eradicating NTM infections in highly selected patients. This chapter will present proposed indications for surgical intervention in patients with NTM disease, the recommended preoperative evaluation of potential surgical patients, surgical techniques, post-op management, and management of postsurgical complications. Additionally, surgical management for extrapulmonary infections is discussed.